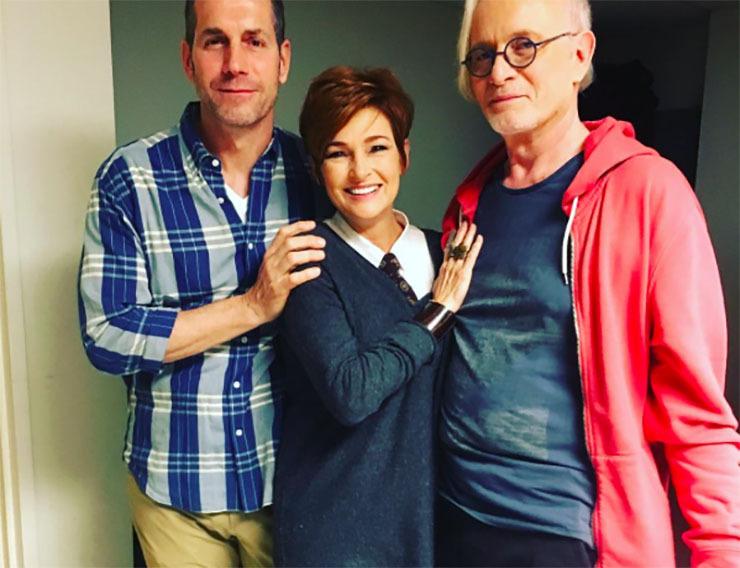 Ron Carlivati, Carolyn Hennessy, and Anthony Geary of General Hospital. Of all the coffee shops in all the world, Anthony Geary had to debut his new ‘do in one across the street from Tracy Quartermaine’s Danish art dealer in fictional Amsterdam. It won’t be soon that any GH fan will forget the way that Jane Elliot’s last scene on the ABC sudser played out–and how the two Port Charles icons involved delivered for fans. Related: If you missed Jane Elliot’s swan song ep, you can still see it. As Elliot walked into that coffee shop, another customer moved out of her eye line and she saw…Luke (Anthony Geary)! The amount of joy, yearning, comfort, and affection contained in their mutual gazing is a great example of the magic of daytime. Elliot’s peepers positively sparkled, and Geary looked like the camera cut away just before his brimmed over with tears. We’re guessing, but we think one of Tracy’s first questions for Luke might have been about his new look–especially has awesome new hairdo! Some costars of his certainly went that route upon seeing him on the GH set again, reported Soap Hub. Also: She’s baaaaaaaaaaaaaack–Helena’s GH return! Kin Shriner (Scott Baldwin) was the first to query Geary on his new ‘do. “I said, ‘Tony, there’s an elephant in the room we must address. Your haircut? He laughed,” said Shriner. “‘I went through two tubes of hair gel trying to get it in a different direction. It’s a big cut over in Amsterdam!’” Geary responded. We’re all about out-of-the-box thinking, being interesting, and surprising people here at Soap Cities, so we say, “Yes!” to Geary’s new cut. Must-Read: Our uncensored Q&A with Jacklyn Zeman. Don’t Miss: Antonio Sabato, Jr. set to run for Congress. What do you think of it, dear readers? Next Article Days of Our Lives Spoilers, Thursday, May 11th: Claire Has a New Target for Her Tantrums: Victor! It’s definitely interesting. Leave it to Tony to come up with something so different and modern!